Been there, done that. Obviously we pay for the view, because it's definitely not worth it for the food, or the shakes. Yummy... Today would be perfect to be down there instead of the golf range. Almost got heat stroke. Very niice. This place is where I took my girl friend for our very first date. There is this shake named "monkey bar" something. I remember seeing lots of over sized squirrels around the eating area. I thought this blog was about local, small eateries in OC, not corporate, souless chains like Ruby's that seized, and ruined such local, small eatieries. What Ruby's did was take something with real history and authenticity and toss that aside in favor of Ruby's faux history (Despite the 50s look, Ruby's wasn't created until the 80s). I've eaten here before, a few years ago before the Ruby's takeover. Had no idea that even happened. Actually, that's why I came out there. The weather was the perfect excuse to do some 'research' for a blog post. True. If I had the shake anywhere else, I'd would say it was just an normal, overpriced shake -- which it is. It's the same effect that Puka Dog has on people in Hawaii. I knew it was a tourist-trappy gimmick, but still I had to have one. Because, after all, I was in Hawaii. I only wish I had my swimming trunks. I'd a gone swimmin' afterwards. It's one of those kinds of places isn't it? Nostalgia, and the view reigns over all else. they're too easy. There's no point writing about a place if it's been PR'd to death. Plus, it's boring. From time to time, if I like the food (like Lucille's) I'll feature a chain. But I hope you noticed that this post is actually a veiled critique on Ruby's. I lament the higher prices they've imposed on the shakes and pointed out how they've seemed to monopolize seaside eating in OC. 3 out of the 5 piers in OC has a Ruby's at the end of it! But even still, you've got to remember, before Ruby's was a bland chain, it was a homegrown burger joint out of Balboa Pier (yes in the 80s), and was as local, and small an eatery as you can get. As a Ruby's, the place no longer has quite the same feel. Unfortunately, I've never tried it when it was still independent. Too bad. I think the yellow paint is better than the plain, unimaginative white-wash the Ruby's folks have colored the thing. I wonder if the shakes tasted any different back then. I don't know about the Shake Shack. I think it may have been better before Ruby's bought it but seriously do we know? Maybe it's just our nostalgia making us remember the shakes as being better before they were "corporatized". Ruby's does stay true to what the Shake Shake originally offered and it's a lot cleaner than before and even then, it's still a place that's nice to go and watch the beach. Also they've kept that cool "till sundown" closing time. 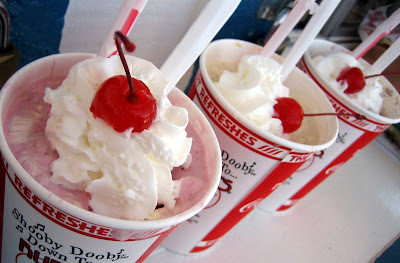 But seriously, I really don't think they shakes were ever that good nor are they still that good. Next time go to an in-n-out, grab a neopolitan, and watch the sunset from your car. To be honest, the critique of Ruby's was so veiled and subtle that I didn't originally pick up on it. "But even still, you've got to remember, before Ruby's was a bland chain, it was a homegrown burger joint out of Balboa Pier (yes in the 80s), and was as local, and small an eatery as you can get." Personally, I've always disliked Ruby's, even before it became the corporate chain that swallowed up local landmarks where Alice doesn't live here anymore. Even, when Ruby's was small and local, it came across as sterile and fake to me in the way it tried to ape a 50s diner. It would have been fine if it had been a real diner that had been around since the 1950s, but Ruby's came across as lame where it was trying to be something that it wasn't. And, more importantly, I've never found the food at Ruby's that interesting or that good. Hey! I live in OC and love your blog! I added a link to your blog on mine! Your points are well-taken. And you're right, my critique might have been so veiled it was hard to pick up on...But while I have no major beef (pun intended) with Ruby's fake 50s theming, I agree that their food is meh. Though if you think Ruby's is bad, you've got to checkout Beachcomber. It's double trouble: bad food, high prices. But then, its setting is perfect. Same with the shake shack...if the view wasn't there, I don't think I would've bothered with this review...luckily I was in a good mood, the weather was nice, and the ocean air refreshing. glad you found me! hope you like what you see! I'm up in that area every once in a while. I'll be sure to check it out next time. I'm such a sucker for milkshakes. I'm much more a sucker of ocean views. The milkshakes are just the icing on the cake...and with that, I think, I've committed one too many loopy metaphors. did you get yourself a wide angle lens to get a couple of those wiiiide shots? Wide angles are necessary to capture all aspects of the scenery. *WINK*. And hells yeah! Lucille's may be a chain, but if McDonalds were able to make ribs like that...I'd still go. HAHA! Oh you know I would LOVE to make a list of my most hated. And I've come close sometimes, but after my anger subsides, I kind of revert to live and let live philosophy when it comes to bad restaurants. I'll leave it up to natural selection to weed them out. I don't have much faith in natural selection and wisdom of the crowd when it comes to food. Its this same free market that's given us tasteless peaches and long lines at mediocre places like Ruby's while gems with tasty food sit empty and close down all the time. For example, I know that the person who makes the food at Champion that you enjoyed so much has had to close down four restaurants over the years and now has to sell her food to Champion, only to have Champion nickle and dime her. 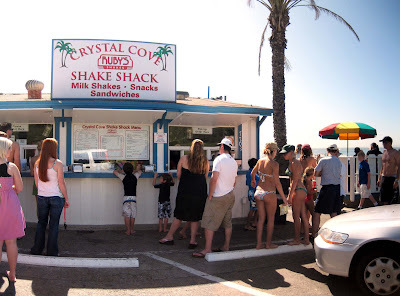 The pre-Ruby's Crystal Cove Shake Shack was one of my favorite places in the OC. It makes me so sad that Ruby's bought it out. And to those who think that nostalgia sweetens the earlier shakes beyond reality, I have to disagree. They were genuinely better. Elmo, thanks for reviewing this. Bad restaurants do go away. Case in point: Aji Grill in Irvine. You may not know about it because it's already gone. But when it was around, my god...it was like an episode of Kitchen Nightmares. But yeah, I can go on until I'm breathless about restaurants that I think are undeserving of the long lines they seem to attract. Although I'm not as passionately against Ruby's as you are (I really can't tell Ruby's apart from Johnny Rockets anyway) I'm more puzzled at the wait at the Black Angus. Weird! It saddens me that I never got to try it under the original owners. Bummmer. I guess it's true what they say: "You snooze, you lose." This probably isn't the most appropriate place to discuss this, but I'm fascinated by why some restaurants succeed while others fail. I think for most places, they just need to meet this minimal threshold of quality and taste. Beyond that point, I don't think there's necessarily a correlation between quality food and success. If anything, a lot of times, its the place that serves the best food or best value food that struggles because it takes more effort and money to do that and they are not neccesairly rewarded by the market for doing that. It sounds like you're talking about the US version of Kitchen Nightmares, which is a really weak, watered down version of the superior UK Kitchen Nightmares. If you haven't had the chance, you should really try to watch the UK Kitchen Nightmares. And, I really adore Last Restaurant Standing. Its a gem of a show, and really, really good. The amazing thing is that its part of the reality competition genre, and yet its challenges are actually important and relevant to determining which restaurant will thrive. Oh no, I don't watch Kitchen Nightmares. I just enjoy the cringe inducing clips on "The Soup" on E! The only competitive cooking show I watch is Top Chef. Also! Speaking of Top Chef! I ran into Elia (Top Chef Season 2) at The Getty on Sunday (4/20/08). Not that anyone's reading this cares...but just thought I'd document it for my own records. One of the reasons I enjoy Last Restaurant so much is that I feel that the challenges are truly important and representative of what a restauranter needs to succeed, whereas I'm not so confident I can say the same about Top Chef. At times, Top Chef comes across more as Top Caterer. For example, take that challenge where Stephanie, one of the strongest chefs, was almost kicked out because her dish was derided as too restauranty. Yeah, that place is a rip off. Go to McD's and get a shake for $2 (they're better) and go sit by the beach. 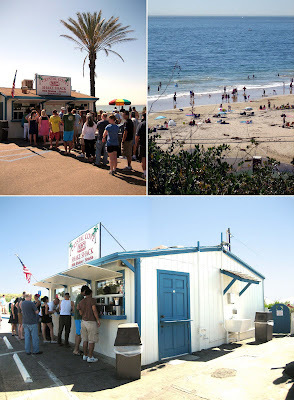 i looove crystal cove.. one of my fave places! Elmo, I hear they r reopening end of June with an extened menu. Will u be reviewing it for us?